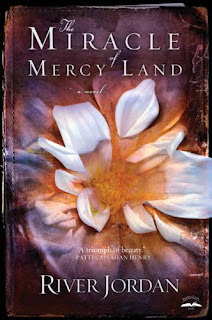 On the front cover of The Miracle of Mercy Land there is a quote by Patti Callahan Henry (whom I have never heard of) who says of this book, that it is "A Triumph of Beauty." I'm inclined not to argue with that statement. The story takes places in the 1930's, before the onset of World War II. Most of the story is told through the eyes of Mercy Land, a girl who grew up in a small town (not on the map, really) called Bittersweet. She makes a move to Bay City, Alabama and ends up working a job at a newspaper. She works for a man named Doc who has run the local paper for longer than most people can remember. Then, in one moment, on a fateful day, a mysterious book shows up on Doc's desk and he calls Mercy in to share and keep the secret of the book. This mysterious book that begins to possess the lives of Doc and Mercy is magical, mysterious, and quite deadly. It has great power and raises lots of question marks. I'll recommend it to you. Without hesitation! I thoroughly enjoyed reading this fabulous story, full of plot twists and turns, which clearly differentiates between the powers of darkness and truth. I completely lost myself within the pages and enjoyed the brief getaway! If you stumble across a copy of The Miracle of Mercy Land , I'd enthusiastically encourage you to pick it up! It is a kindred spirit to The Silent Gift, by Michael Landon, Jr. (linked to my review.) Spell binding. My thanks goes to KBK Public Relations who asked me if I wanted to read this book, and sent a copy despite my hemming and hawing about it. I wasn't sure I would be able to get to this book in a good time frame but they persisted! Sometimes I'm glad for other people's follow through! I am glad not to have missed this tale and I'll read anything by River Jordan that I an get my hands on now. Grrr. My library doesn't have this. Now to make the difficult decision of whether to ILL or purchase--'cause your review has definitely intrigued me! It sounds like a lovely book. I don't usually go for any kind of Christian fiction because they can be too preachy, but this one doesn't sound like it falls into that trap at all! I am totally intrigued now. I've added to my list. I've got Saints in Limbo, but haven't read it yet. My library has The Gin Girl, but not the newest. I think I'll request it. I'm also adding The Silent Gift to my list. Okay...it's on my list now! I have wanted The Silent Gift for a long time...back when Meghan was not capable of more than a couple words. Hmm. I'll have to look into this. Interesting author name -- a pseudonym? I find so little Christian fiction, that is really enjoyable, and comfortable to read - this looks interesting. I haven't read this one yet (my copy hasn't arrived, sob! ), but I read Jordan's Saints in Limbo and it made me want to read everything she's ever written. So, while I barely skimmed your review, I can certainly recommend Saints in Limbo. I truly enjoy reading your blog! Thanks for sharing. I really want to read this book! I'm glad to hear it's so good. Okay, I'm sold! I still haven't read that Michael Landon, Jr. book, but I will eventually get to it! I have this one on my list for review in the coming weeks. After reading your review and I'm really looking forward to reading it. I think the idea of Christian Fiction is get across ideas of faith. In our daily lives I think that should be done in a subtle way, not hammering people over the head, and that's also how I think it should be done in fiction. I'm glad that this book is able to get the point across without the hammer.